All your NoSQL Apache Cassandra and ScyllaDB resources in one place. The Scylla team announces the release of Scylla Open Source 2.3.5, a bugfix release of the Scylla Open Source 2.3 stable branch. Scylla Open Source Release 2.3.5, like all past and future 2.3.y releases, is backward compatible and supports rolling upgrades. Note that the latest stable branch of Scylla Open Source is release 3.0; you are encouraged to upgrade to it. The post Scylla Open Source Release 2.3.5 appeared first on ScyllaDB. The post Scylla Open Source Release 3.0.5 appeared first on ScyllaDB. The post Natura’s Short and Straight Road from Cassandra to Scylla appeared first on ScyllaDB. The post Scylla Cloud Onboarding appeared first on ScyllaDB. The post Introducing Scylla Cloud: The Fastest NoSQL Database as a Managed Service appeared first on ScyllaDB. Today’s blog post was written by Mourjo Sen, Software Developer at Helpshift. In this post, we look at Helpshift’s journey of moving to a sharded model of data. We will look at the challenges we faced on the way and how Scylla emerged as our choice of database for the scale that Helpshift 2.0 is aiming to serve. Helpshift is a digital customer service platform that provides a means for users to engage in a conversation with brands. It is comprised of many features which can be applied to incoming conversations. To name a few: automated rule application, segregation by properties, custom bots, auto-detection of topic, SLA management, real time statistics, an extensive search engine among others. Helpshift’s platform handles a scale of 180K requests per second currently and the scale keeps growing day by day. Sometimes, with growing scale, it is required to re-architect systems for facilitating the next phase of the company’s growth. One such area of re-evaluation and re-architecture was the management of user profiles. While this system worked well for us for quite a while, we now wanted the user to be decoupled from the device. This meant that a user should be identified by some identifier outside of the Helpshift system. If someone logs into Helpshift from one device, his/her conversations should now be visible on any other device they logged into. Along with this, we also wanted to change the time at which users were created. This would enable us to provide proactive support to users even when they haven’t started a conversation. With this change, we were expecting the number of users to be 150+ million and the number of requests to the users database to be 30K/sec. This was far too much for the current database we were using. Moreover, the nature of the data and access patterns warranted a very robust database. Firstly, the number of users would continue to grow over time. Secondly, the number of requests per second was unpredictable. Thus, we had to look to a model of databases which could scale as per need. The database needed to support “sharding data” out of the box and adding capacity without skipping a beat in production. To “shard” data, essentially means to horizontally split data into smaller parts. The parts are then stored on dedicated database instances. This divides both the amount of data stored on each instance and the amount of traffic served by one instance. There are many varieties of sharded databases available in the industry today. We evaluated the most promising ones from the standpoint of properties we would like to have in our sharded databases. Our comparison included Cassandra, ScyllaDB, Voldemort, sharded MongoDB, and Google Cloud Spanner. Scalability: How much effort is required to add horizontal capacity to a cluster? Data model: Is the data model able to support complex queries with “where” clauses? Indexing: Are indexes on fields other than primary keys supported? Query language: Is the query language expressive enough for production usage? Throughput and latency: Are there benchmarks in the literature that studies the throughput/latency? Persistence: If a node suddenly dies, is it able to recover without data loss? Upgrading to new versions: Are rolling restart/upgrades supported? Moving to a sharded database requires a change of the data model and access patterns. The main reason for that is that some fields are special in sharded systems. They act as keys to find the instance where this particular bit of data will be present. This means that these shard keys always have to be present as part of the query. It therefore makes it imperative to design the data model with all possible query patterns in mind, as it is possible that some queries are just not serviceable in sharded databases. This data model and schema sufficed for all the requirements we have at Helpshift. It is highly important to check the feasibility of the schema with respect to all query requirements. Figure 3: The number of CQL operations on the ScyllaDB cluster grouped into reads, inserts and updates. The decision to move to a sharded database comes as a natural evolution from the growth of a company but choosing the right database to keep scaling can both be a daunting and rewarding task. In our case, we chose Scylla. If we look at the results closely, the scale we benchmarked for was overcome in production in a course of one year. That is, in just one year, the number of requests we had to serve went from 30K/s to 73K/s. This kind of growth did not get bottlenecked by our backend systems solely because we were able to scale up our Scylla seamlessly as was required. This kind of empowerment is crucial to the growth of an agile startup and in hindsight, it was the perfect database for us. 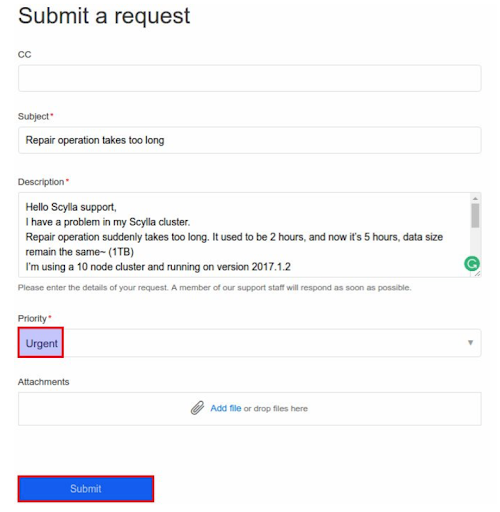 You can read more about Helpshift’s use of Scylla and other technologies, such as their development of Scyllabackup and Spongeblob, at the Helpshift Engineering blog (engineering.helpshift.com). The post Helpshift Shares Its Scylla Success Story appeared first on ScyllaDB. The part that is so frustrating to those of us in the technology industry is that this is all completely avoidable with modern NoSQL technology like Apache Cassandra , and the enterprise version of this, from DataStax. Planet Cassandra is dead, long live to Planet Cassandra ! Page generated by potatopotato. Icon by Vectors Market. Last update: 22 April 2019, 2:00 pm.